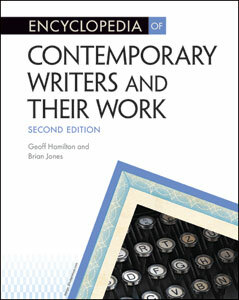 Encyclopedia of Contemporary Writers and Their Work, Second Edition is an invaluable guide to English-language fiction writers born after 1959 and their best work. Coverage includes some of the most vital and appealing writers working today, such as Chang-rae Lee, Michael Chabon, Zadie Smith, and Dave Eggers. Containing more than 200 entries written by literary scholars, this updated resource provides a comprehensive overview of the best writers and works of the current English-speaking literary world. Geoff Hamilton received his Ph.D. in American literature from the University of Toronto and was a Killam Postdoctoral Fellow at the University of British Columbia. His primary research interest is contemporary North American literature. He is a coauthor of Encyclopedia of American Popular Fiction in Facts On File's Literary Movements series. Brian Jones studied literature, philosophy, and education at Queen's University, and did his graduate work in philosophy of culture at Cambridge University. He is a coauthor of Encyclopedia of American Popular Fiction in Facts On File's Literary Movements series.